A stylish titanium and silver two-colour ring for the modern man. Simple yet elegant, this ring features a horizontal band with a matt and polish finish. 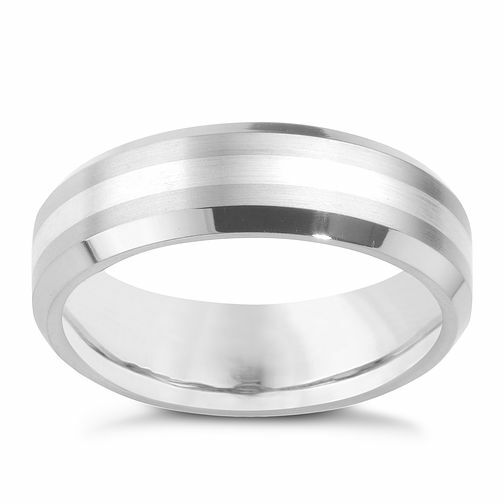 Men's titanium ring is rated 4.4 out of 5 by 5. Rated 4 out of 5 by Anonymous from Good product Not a fan of rings but this one is nice. Not too shiny but quite good detail on it as well. Rated 4 out of 5 by Anonymous from Very happy purchase I bought it along with Tissot PR200, it looks more glossy and bright that in the picture, the interior ring is so smooth.However it is abit bulky in me finger, all in all I love it, and I loved the idea of wearing Titanium on!